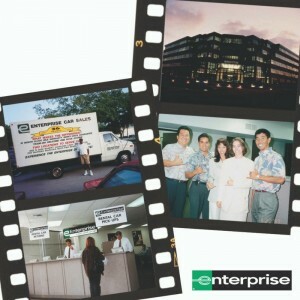 With a newly adopted name that clearly reflected the predominant role of the neighborhood rental business, Enterprise Rent-A-Car launched an unprecedented era of expansion during its fourth decade. The company successfully applied and adapted its proven business model in new markets like Hawaii, Canada and Great Britain. Fueled by its first national advertising campaign and the message, “There are better-known car rental companies than Enterprise, but none that know their customers better,” U.S. growth exploded. The number of locations and units in service multiplied – and the company was recognized as the largest rental car company in America. -Over 300 offices throughout the U.S.
-First national advertising campaign launches in U.S.
-Enterprise moves up to 150th largest private company in U.S.
-Enterprise ranks as 56th largest private company in U.S.